The 25-year-old from Austria upsets No. 3 seed Sergiy Stakhovski in the final. 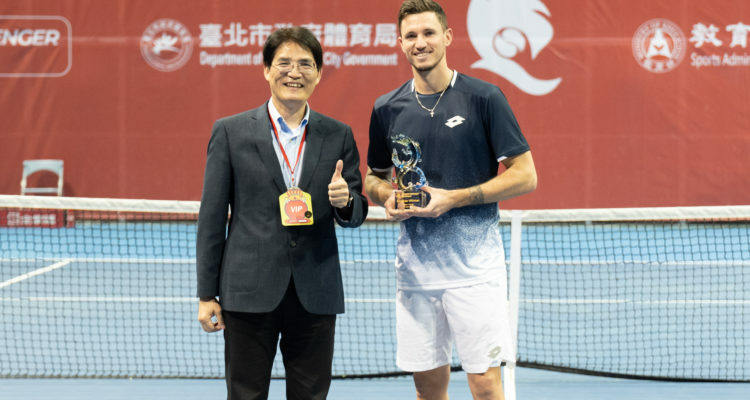 Dennis Novak from Austria claimed his maiden title on the ATP Challenger Tour, winning the $162,480 Taiwan Santaizi Challenger held on hard courts at the Taipei Tennis Center. The 25-year-old upset No. 3 seed Sergiy Stakhovsky from the Ukraine 6-2, 6-4 in Sunday’s singles final. Novak fired 10 aces, winning 87 per cent of his first service points to prevail after only 61 minutes. The No. 11 seed advanced to the title match after a first-round bye with wins over Renta Tokuda, Kaichi Uchida and Yuichi Sugita of Japan as well as Soonwoo Kwon from Korea. By ending the singles title drought for Austrian players on the ATP Challenger Tour of more than 265 days, Novak collects $21,600 in prize money as well as 125 ATP-Ranking points. Last champion from the Alpine country was Sebastian Ofner, lifting the President’s Cup in Astana in July last year.  Dennis Novak is the champion in Taipei! Earlier in the day, N. Sriram Balaji of India and Jonathan Erlich from Israel took the doubles title. The No. 3 seeds defeated Sander Arends from the Netherlands and Tristan-Samuel Weissborn of Austria 6-3, 6-2. The encounter lasted one hour and one minute. This entry was posted in ATP Challenger News, ATP Challenger Tour and tagged ATP Challenger Tour, Dennis Novak, Taipei, Taiwan Santaizi Challenger.